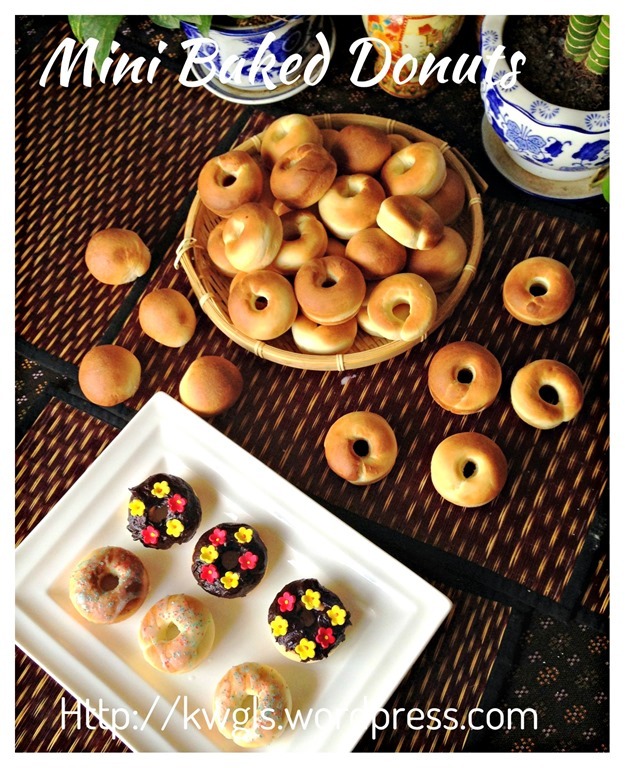 While I was window shopping in a bakery shop in Singapore, I saw a promotion on these mini donut trays, 2 of which is SGD19.80… I feel the urge to purchase the trays as I have failed once with my baked donuts because the holes had disappeared after my baking. I decided to buy the trays thinking of preparing some baked donuts or possibly used for agar agar or other mini Bundt cakes..
To be fair with the readers who do not have these mini donut trays, I have prepared some of which is round in shape of the same size and you can always used the same method to decorate your cute small balls. Taste and texture of course are the same..They are just in different shape. 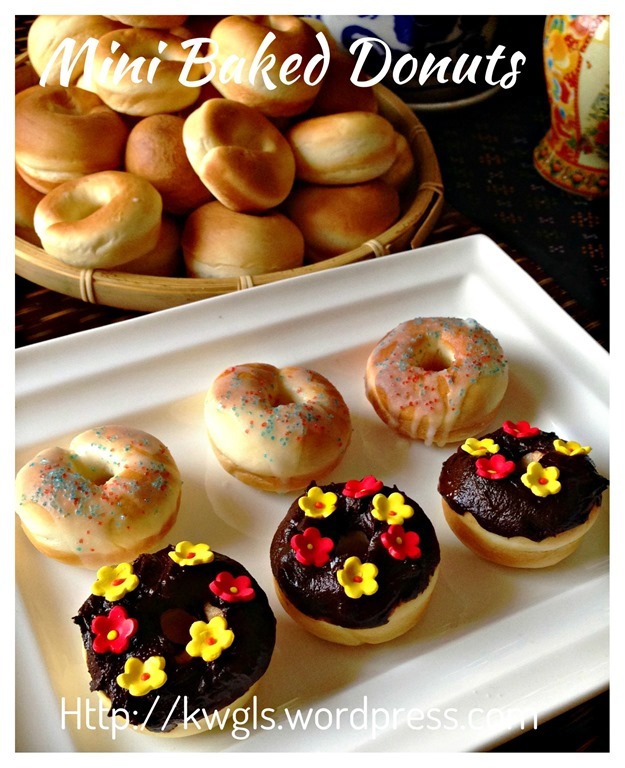 These are the baked version of the donuts. They are different from the deep fried version.. Frankly speaking, the deep fried version is more aromatic and of course, every readers will know it is unhealthier. 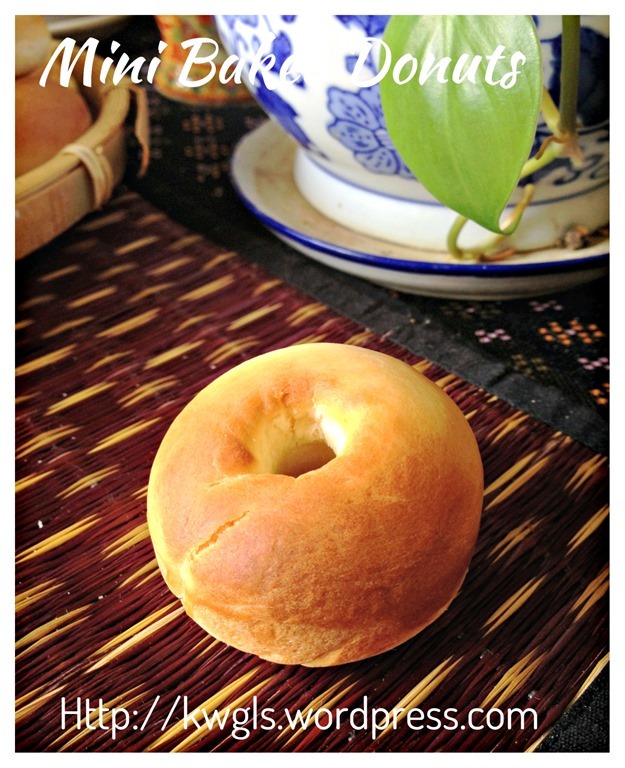 It is a type of bread but the recipe have much higher sugar, butter and eggs to make them more aromatic and flavourful. It is intended to eat as its own or with some simple glazing. 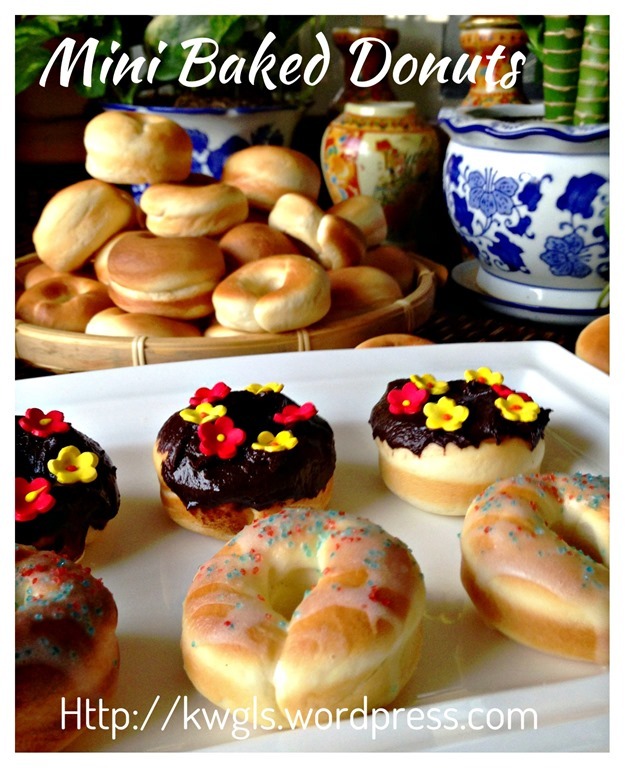 It will definitely be a hit as a party snack due to its mini size. Glazing is definitely not my area of strength and in fact, I hate anything to do with glazing of cakes. I just prepared some with simple ganache and some with icing glazing for purpose of picture taking. 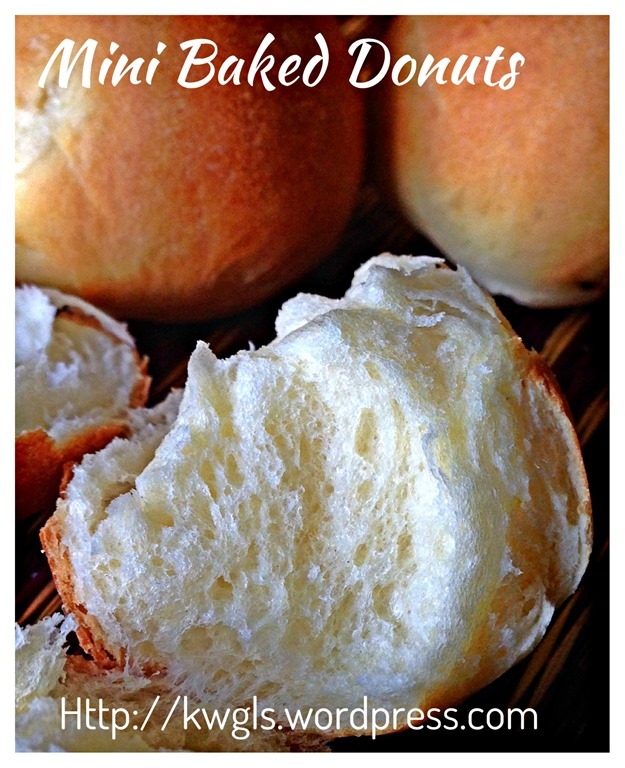 Because of its mini size, baking and proofing were very fast… In fact, they were so fast that I have to bake it by batches as soon as it reached 2/3 height of the baking mould’s height.. 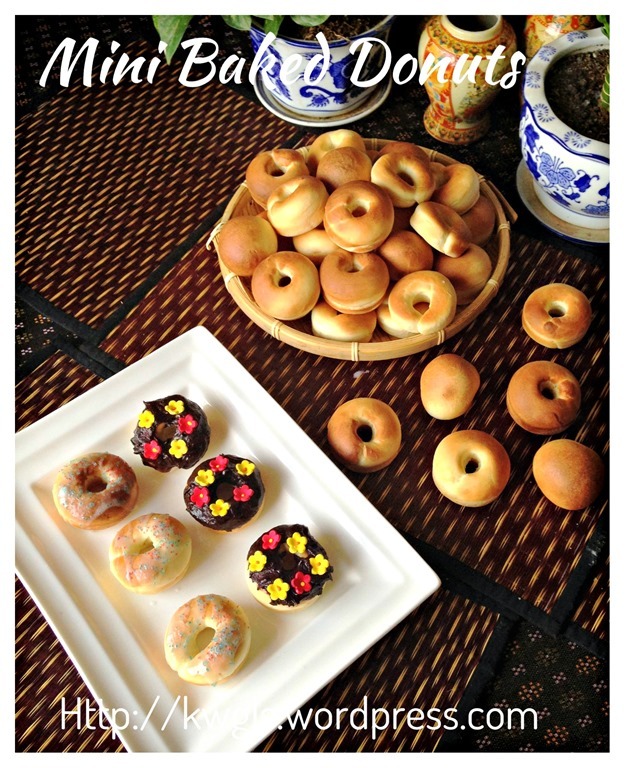 It is definitely a fun attempt to do these mini donuts. 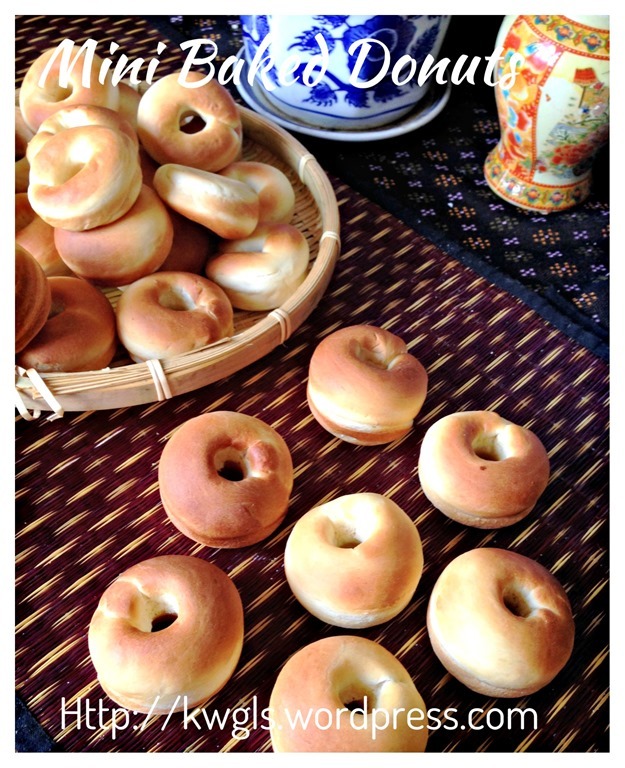 They do look like bagels but this recipe yields a much fluffier and soft bread than the bagels that I have tasted before. 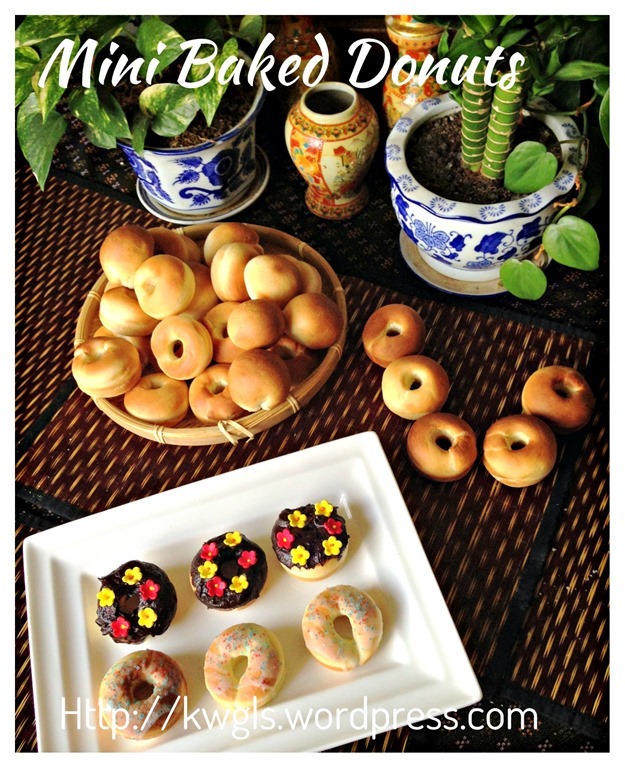 In fact, on the second day of preparation, it is still soft and my wife and my mother in law have eaten these mini donuts without any glazing on. … It is a rather healthy snack…. Melt the butter and let it cool slightly. Add in eggs and milk. 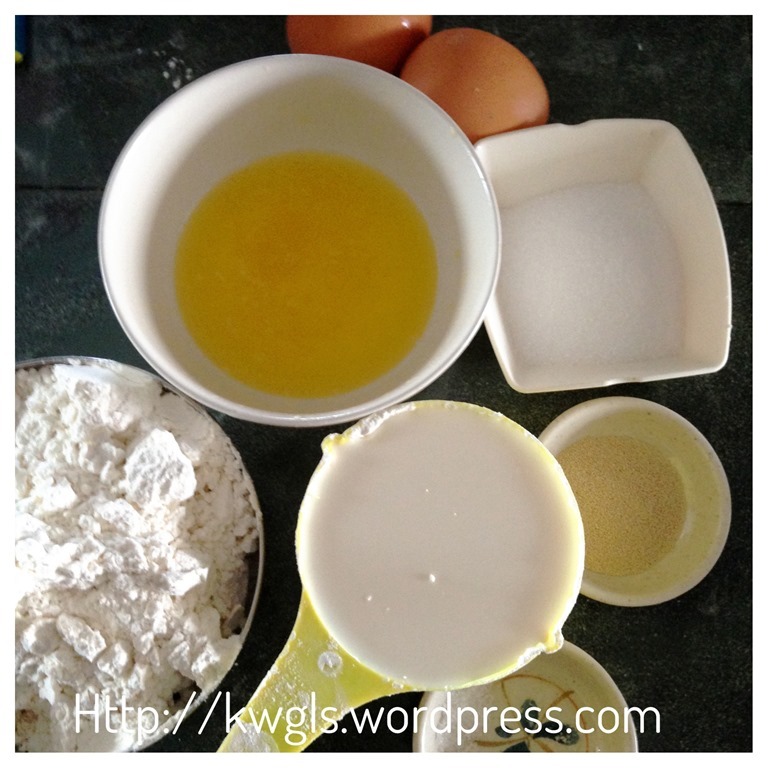 In a bowl of a standing mixer, sift in all the flour, add sugar and yeasts, stir until well mixed. Add the liquid mixture. Use a tablespoon to lightly stir it to make it look like a paste. Transfer the bowl to the standing mixer, use medium speed to knead it until the dough is smooth and leaves the side of the bowl. This will take about 20-25 minutes. If it is too sticky, add some flour tablespoon by tablespoon. If it is too dry, add additional milk teaspoon by teaspoon. Once done, transfer the dough to a lightly floured surface. Shape it into a round ball, covered with a clingy wrap and let it proof until double in size. 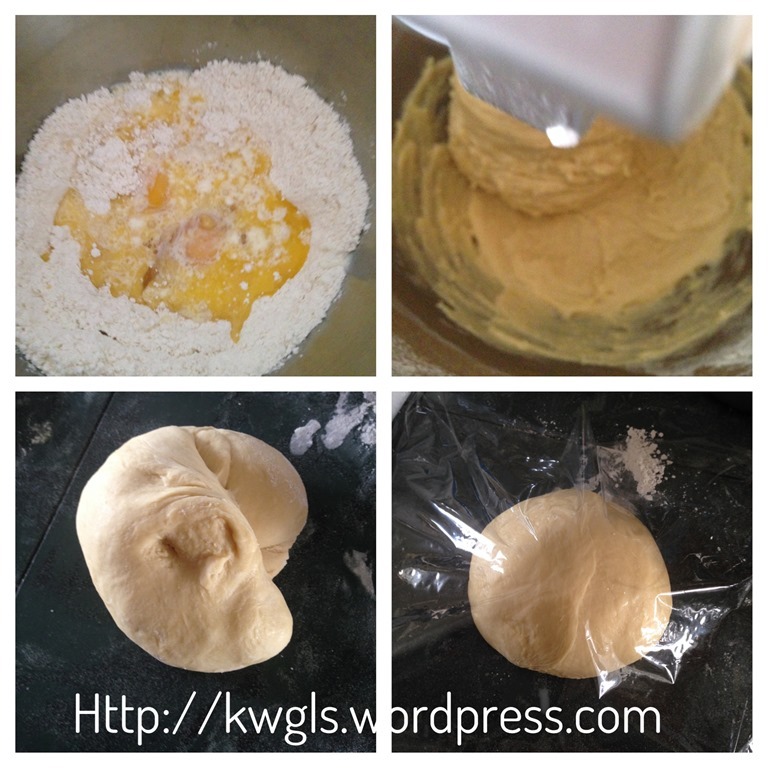 Once it doubles in size, divide the dough into 15 grams each. Take one portion of the dough and use the hand to lengthen it until it look like a thick string. 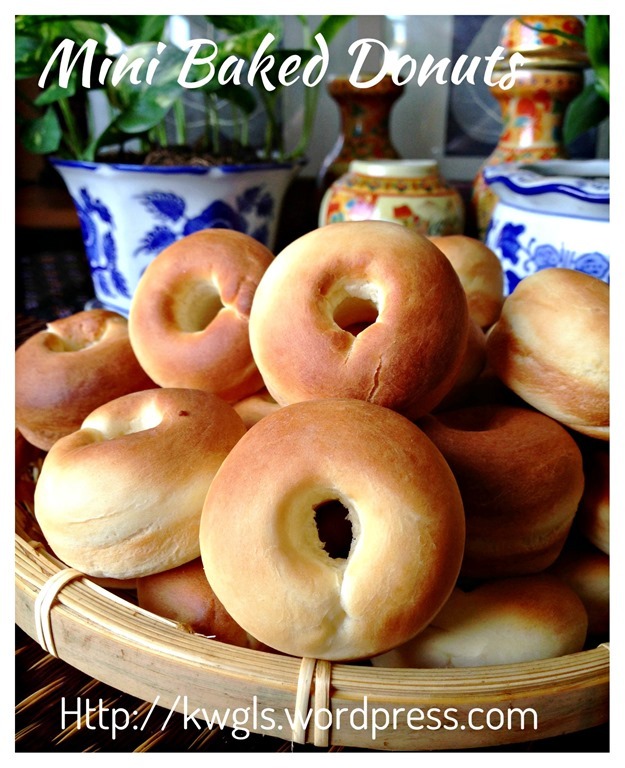 Seal the edges and out on the mini donut tins. 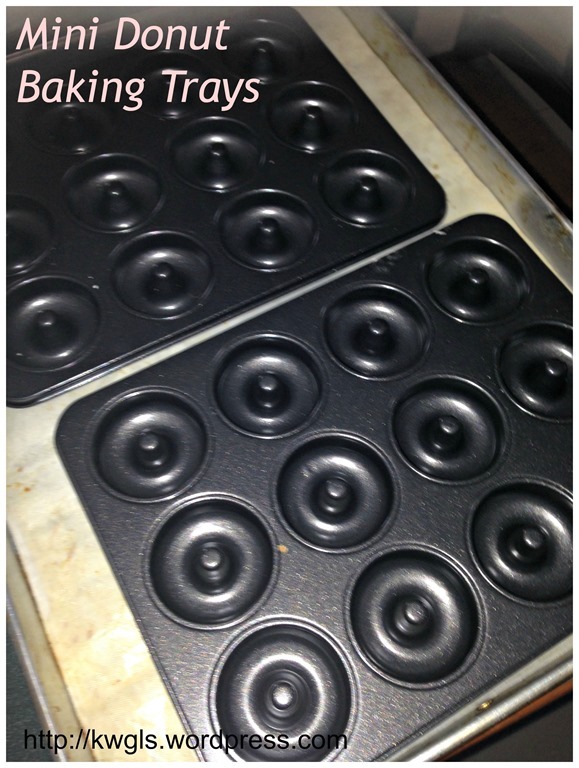 If you do not have a donut baking tin, just shape it round and put in a greased baking tin. Note that 15 gram is a guideline. The weight should depend on size of your donut tin but it should only cover about 1/3 of the height of the donut tins. Once the shaping had done, let it proof until double in size. Note that for this step, it is rather fast at it took me about 15 minutes on the day’s weather. 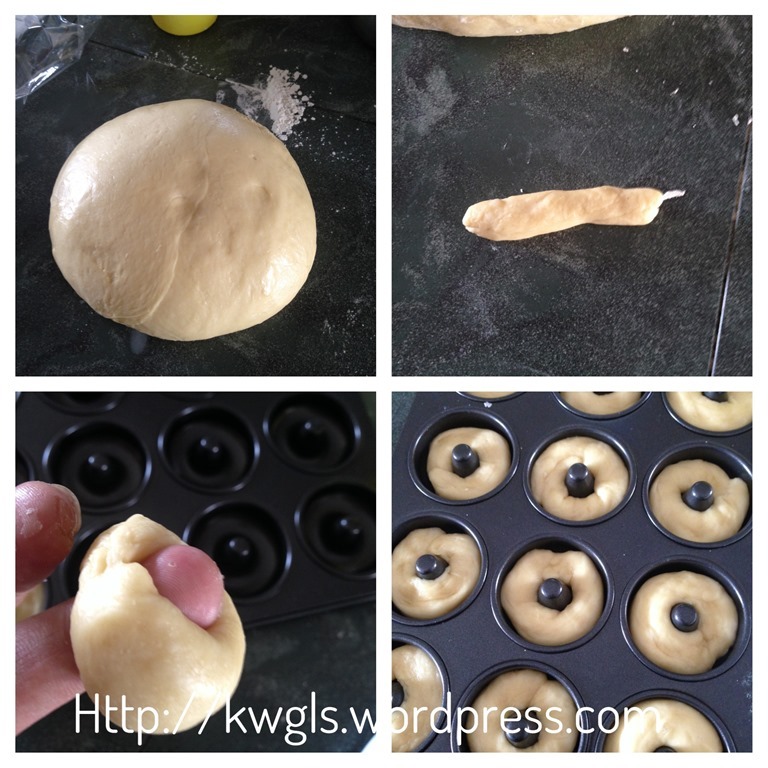 Try not to proof until it reach the full height of the donut baking mould as it will rise further when baked. 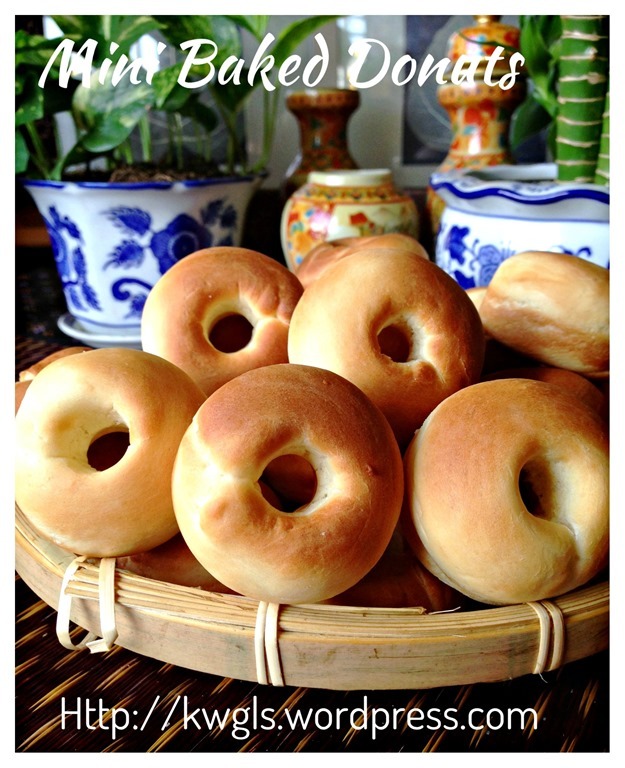 If it rise too high, when baked, the holes will be sealed. After the dough is about 2/3 of the height of the baking mould (or the dough doubles the size), bake in the pre-heated oven at 200 degree Celsius for 5-8 minutes. This bread can get cooked rather fast so keep in an eye on the oven. 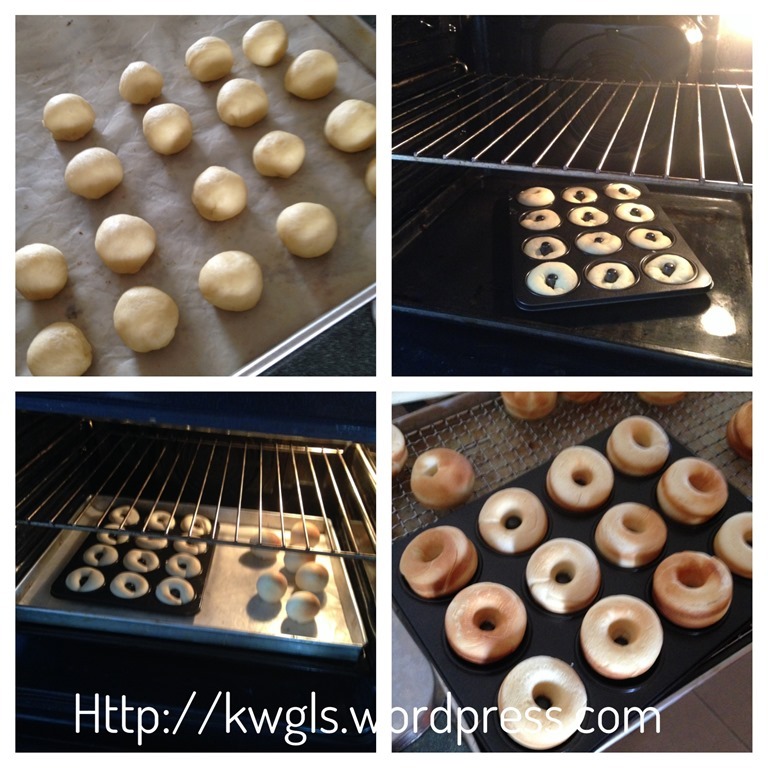 After baking, if you find that the holes in the donut are very small and some are sealed, take out the donut, invert it and press the small holes into the mould and the holes in the donut will become more obvious. As a down to earth house dad, I would not advise you to specially go and buy this special mould just to bake this. You have justification to buy it if you are going to bake it often for parties or use it to prepare other desserts. 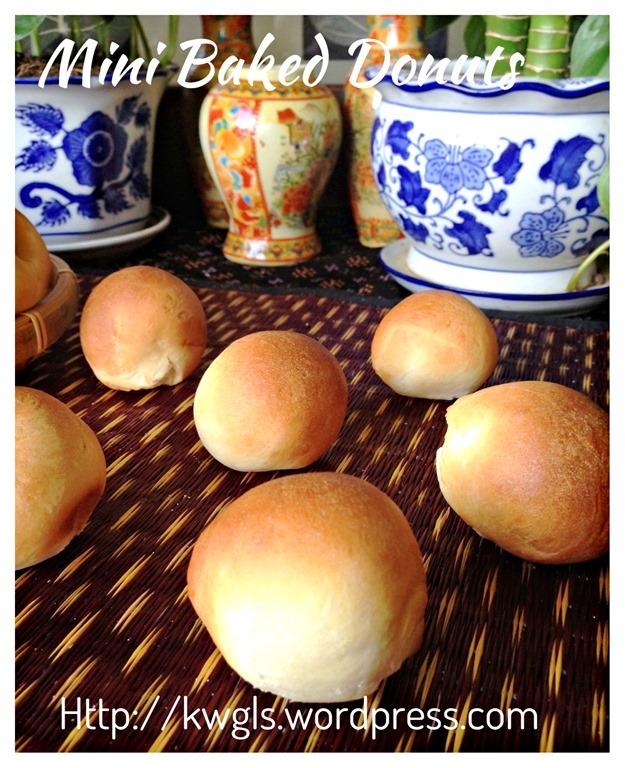 Otherwise, small balls shape donuts is equally attractive. I am never good at cake decoration and do use your favourite ganache or other frostings and come out with a version of your own. 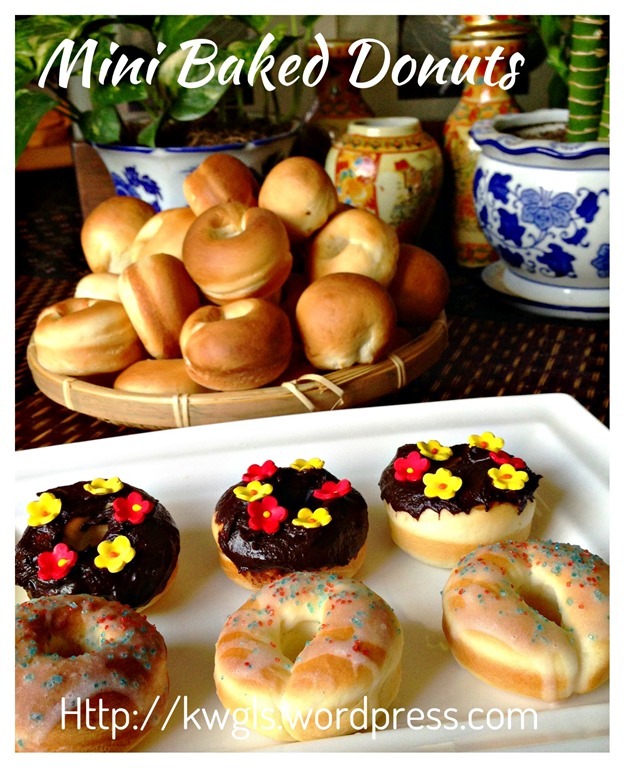 This entry was posted in Breads and Pizza, Food Preparation Series, Party snacks or finger foods, Snacks and tagged 8, baked donuts, 甜甜圈, 迷你甜甜圈, GUAI SHU SHU, Guaishushu, kenneth goh, mini baked donuts, postaday. Bookmark the permalink. Thank you Veronica for your support. Yes, it is indeed much healthier and definitely a presentable item in a party setting. As long as your dough is too much and you let it proof enough, it is soft as bread. Those fat and cute donuts are very soft indeed, well aerated. That is why I advise that that the dough do not reach 1/3 of the height of the mold, proof until 2/3 and bake become the full donut. I would say, because of its size, this donut is not hard but fluffy. Hi, does this wrk on donuts machine? I never own donuts machine and I am unsure..